PT-41 is a 77 foot PT-20 class Elco, shown here on the Elco transport cradle. The reverse shear is an attractive feature of the class. 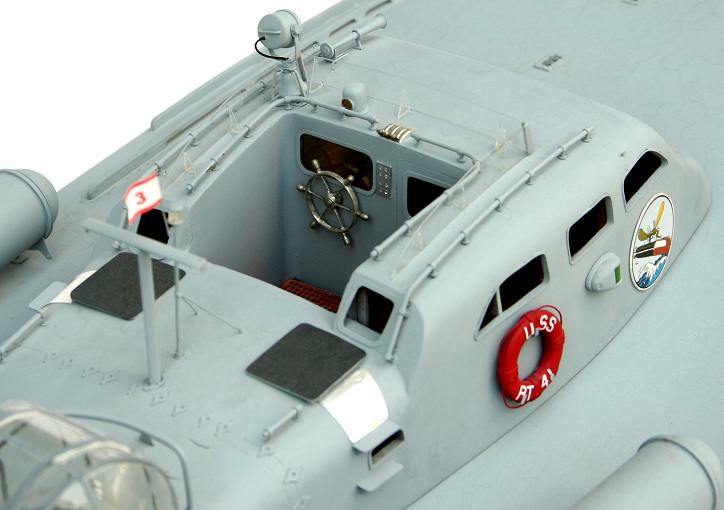 PT boats have more than one good reason for their popularity with modelers. For the romantic, there’s the swift boat and small crew taking on battles with lopsided odds. The R/C enthusiast can delight in the speed and handling, a far cry from a plodding tugboat. And the scale model builder has the opportunity to create fine detail, made so much easier when creating big models of small subjects. A number of plans, kits, and fittings are available for various classes of torpedo boats. By far the most popular is the Elco 80 footer of the PT-103 class, so famously associated with Lt. John F. Kennedy and his PT-109. I chose to scratch build a subject less known in shape, but with another famous story—PT-41, the 77 foot Elco skippered by Lt. John D. Bulkeley. PT-41 ferried General Douglas MacArthur out of the Philippines, and was immortalized in the book and movie, “They Were Expendable”. 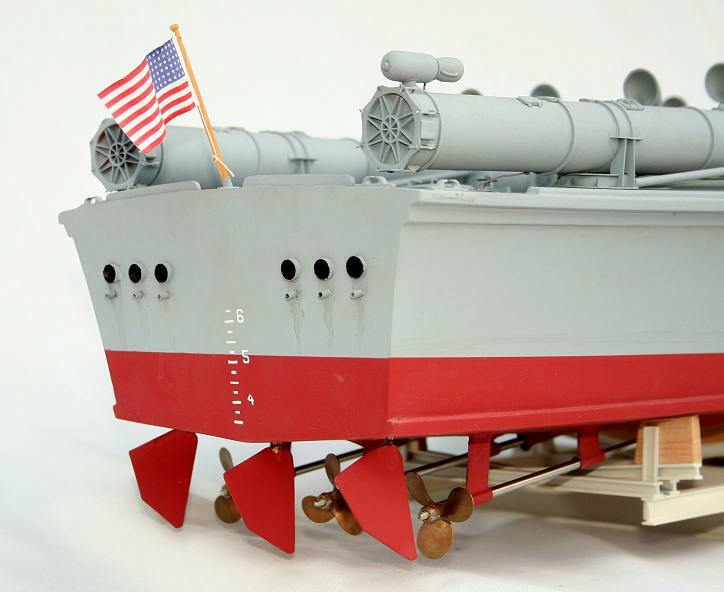 In 1:20 scale, the model is nearly four feet long with a 12.5 inch beam. A small number of craft were built for the Navy as the US experimented with torpedo boats in the days leading up to World War II. PT-9 was designed and built by Scott-Paine in the UK, and was purchased by Elco to jump-start their own torpedo boat design effort (Johnson 26). Elco’s first group of self-made boats, PTs 10-19, was a development of the Scott-Paine 70 foot hull with modifications to the cabin and other details. In order to better carry four 21-inch torpedoes, this design was stretched to 77 feet in the PT-20 class, of which PT-41 was a member. A later group of 77 footers, PTs 45 through 68, featured a flowing transition from the cockpit to the trunk cabin in place of PT-20’s notch-back pilot house. Finally, the 80 foot PT-103 ushered in a new class of more angular boats which were built in the hundreds with a wide variety of armament. 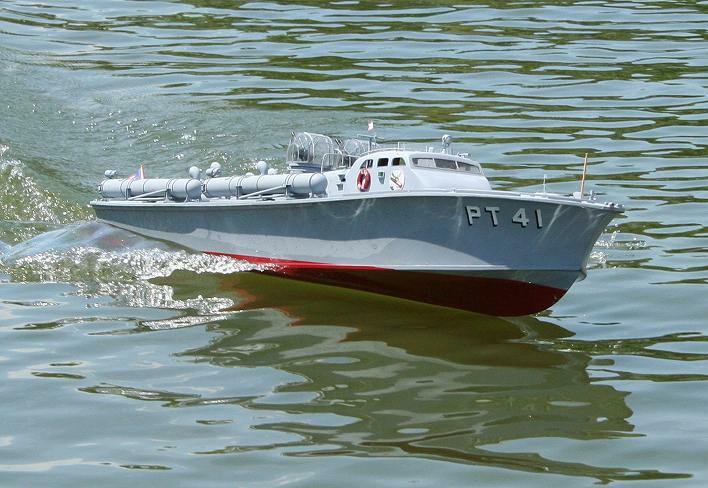 PT-20, first of the 77’s; 21-44 would get a boot added in front of the pilot house, and a new style of turret. A late 77 footer, with pilot house faired into the cabin trunk. PT-140, an early example of the 103 class. This one has the dark gray deck. Contrary to popular myth, these were not plywood boats. While plywood was used to skin the cabin and sometimes in the decking, the hulls were framed and planked in African mahogany, with bits of cedar, spruce, and white oak thrown in (Elco, drawing 1017). 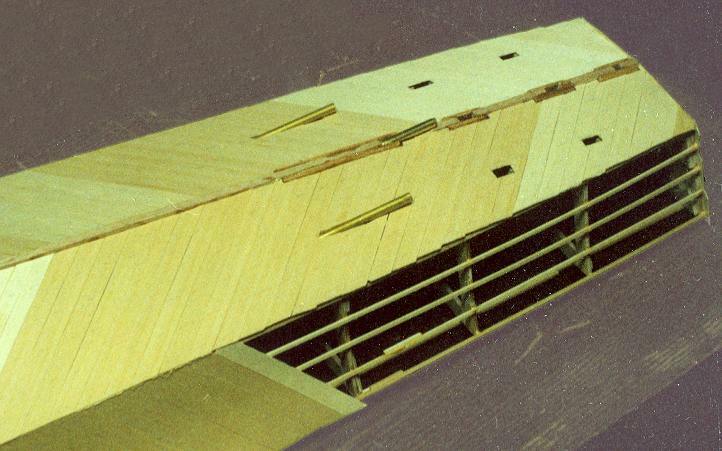 The two layers of 3/8” and 7/16” planking were laid on the bias, not longitudinally, being secured with brass and Monel screws with a layer of glue-soaked fabric in between to aid water tightness (Ferrell and Ross, 55). Example of the detail available from the microfilmed Elco drawings, which includes wood types. Section through the hull at the cockpit. The PT-20 class’s armament consisted of four Mk. VIII torpedoes in deck mounted tubes and a pair of twin 50 caliber machine guns in hydraulically powered turrets. Some boats substituted up to eight depth charges for the two after tubes (Lambert and Ross, 118), but it appears that all six of Bulkeley’s Squadron 3 boats had a full set of fish, as seen in photos of the boats loaded as deck cargo on a tanker (Polmar and Morison, 21). The torpedo tubes were heavy steel weldments with a pivot aft and a training mount forward. The tubes were cranked out several degrees in order to muzzle-load and to launch the torpedoes. Black powder ejection charges in detonation chambers were electrically fired from the cockpit, but in case of misfire, a mallet-blow to a firing pin could also get the job done. Thirty caliber Lewis guns were added on stands ahead of the pilot house, but were probably not present on PT-41 during her trials in July or August 1941. Photos of her sister, PT-32, show that several details, including the Lewis guns and an aerial from the mast forward, were not yet installed at this point in time (Kelvin-White). Some readers may be looking for the six mufflers fitted on the transom of PT boats—one for each bank of the three Packard V12 aircraft engines. But they weren’t on the early 77’s, which had simple straight pipes out the back. Apparently it didn’t take long to realize that unmuffled aircraft engines didn’t suit stealthy operations, as the mufflers became standard equipment on the 103 class. I chose to model PT-41 as completed by Elco on July 23, 1941, mostly because this was the only time when the large bow numbers were present. These boats started out either overall No.5 Navy Grey, or No. 5 Grey with No. 5-D Outside Dark Grey decks (Lambert and Ross, 175). One color photo of PT-32 (R.J. Reynolds) seems to show the lighter color on deck, so I used that scheme for PT-41. The RON 3 boats were repainted overall 5-D Dark Grey before being shipped to the Philippines as deck cargo on the tanker Guadalupe, and were repainted again at the outbreak of hostilities, this time with an overall dark green (Lambert and Ross, 175). One detail present during trials but conveniently omitted by me is the suite of grey canvas covers over the torpedo tubes and turrets. I rationalize this by saying that the covers must have been removed for inspection at least once in the summer of ’41! Another bit of color comes from the Walt Disney designed emblem affixed to either side of the pilot house, featuring a mosquito-borne torpedo flying over the waves. While this bright bull’s eye was removed in-theater, I’m sure the plaques were carefully stowed and cared for by the crews—unlike the clumsy Dewandre turret domes, which were jettisoned the moment the fighting started (Ferrell and Ross, 62). Later PTs modified the gun mounts and deleted the turrets altogether. And speaking of colors, the US ensign shouldn’t be flown from the stern while underway, at least not on larger vessels, but so it was done on these boats during trials. Later boats had a gaff added to the telescoping mast abaft the cockpit, from which the ensign could be properly secured (Ferrell and Ross, 46). A smaller gaff was fitted to the anchor light, where a squadron burgee was flown. Completed in July 1941, PT-41 and five other boats were shipped to the Philippines in August 1941, arriving September 28. Within days of the attack on Pearl Harbor, Bulkeley’s RON-3 was engaging enemy aircraft at Cavite Base, Manila (White, 16). Through February 1942, RON-3 was involved in actions near Manila. On March 11, General MacArthur and family boarded Lt. Bulkeley’s PT-41 for the harrowing trip out of Corregidor (Polmar and Morison 26). By April 8, RON-3 was down to two boats when PT-41 and PT-34 attacked an IJN cruiser off Cebu (Polmar and Morison, 29). Their claimed hits have been the subject of some controversy, but the story was gratefully accepted by the American public at a dark time in the war. MacArthur ordered Bulkeley and PT-34’s skipper Lt. Robert Kelly to evacuate, which they did on April 13. Two days later, and only nine months after her launch, PT-41 was destroyed to prevent capture (Lambert and Ross 119). Lt. Bulkeley went on to command PT boats during the Normandy invasion, and later commanded the destroyer USS Endicott (DD-495). As commander of the Navy’s base at Guantanamo, Bulkeley stood-down threats from Fidel Castro. 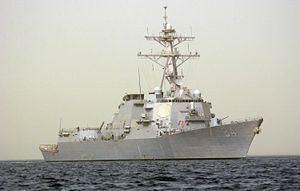 Awarded the Congressional Medal of Honor for his actions in the Pacific, perhaps a bigger honor was bestowed when the Arleigh Burke destroyer USS Bulkeley (DDG-84) was commissioned December 8, 2001 (US Navy)—60 years to the day after the opening of hostilities in the Philippines. 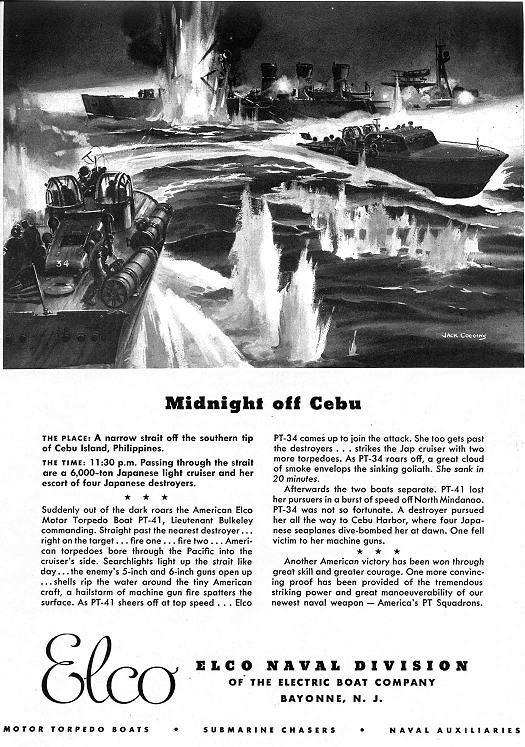 Elco advertisement from June 1942 Yachting magazine describes the attack on a Japanese cruiser by PT-41 & PT-34. The artist worked from photos of the earlier 70 foot boats, evidenced by the short lazarettes, and has left the turret domes in place. A scratch built project can be no better than the plans and references used, so I sought the best I could find. Hull lines, profiles, and general arrangements were purchased from PT Boats Inc., and included some of Al Ross’s fine work. 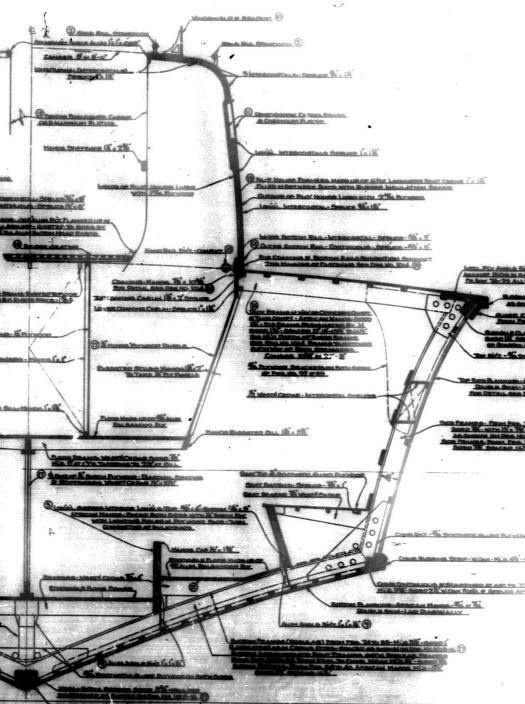 Further invaluable detail was found on nearly 200 microfilm frames of Elco drawings obtained from the National Archives. In addition, several books are available with a wealth of photos and descriptions (see citations). One more fun source: During my research, I started collecting WW2 era magazine advertisements that featured PT boats. With information on or copies of over two-hundred of these ads, I was able to glean a few tidbits, such as a helpful color photo that appeared in a Camel cigarette ad. But the real story here is the ads’ demonstration of the enormous popularity of PT boats in America, long before JFK came to the fore. While reviewing the drawings, I realized that the complex intersection of the flowing cabin with the cambered and sheered deck was going to require extensive layout work. A CAD program assisted me here, letting me work out the curvaceous shapes in 3D space. As a byproduct, I was able to e-mail many of the frames and other parts’ shapes to a laser cutter, which greatly reduced my X-acto knife time. 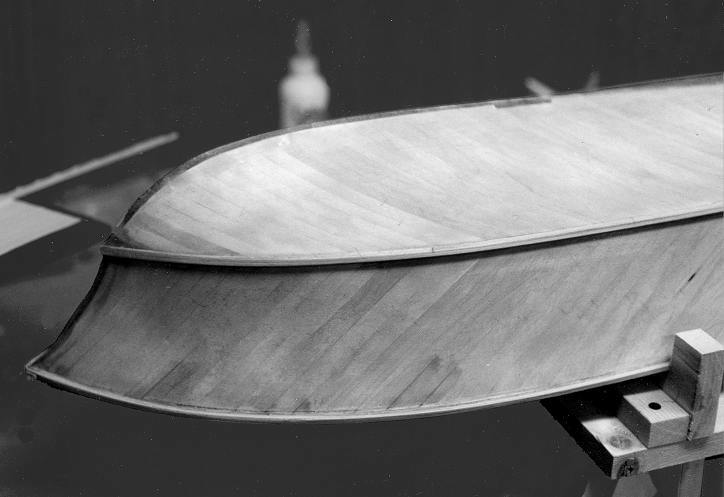 Hull frames were aligned and held in place upside-down by a purpose-built fixture, which allowed the keel and longitudinal stringers to be easily attached from above. Two layers of 1/32” thick basswood planks were applied to the stringers. I experimented with glues at this point—while I liked the strength and working time of epoxies and polyurethane adhesives, I found the set time too long to allow for quick work. Cyanoacrylate (CA) became the glue of choice for much of the work. I’ll jump ahead a bit in time and mention water-proofing. As detailed in my March 2006 “On The Water” column in Ships in Scale, a couple years of sitting through wild humidity swings in Michigan was enough to open up the planks, so I added a layer of fiberglass cloth and resin over the hull. But even with this extra material, the completed hull with deck was significantly lighter than at least one comparable fiberglass hull currently on the market—all-important for a planing vessel, and every ounce saved allows for more battery capacity. Completed planking at bow, ready for ‘glassing. Stuffing tubes were set in the hull prior to planking. Without the bearings in place, steel rods larger than the prop shafts could be used to hold the three sets of tubes and the struts in alignment. With the help of spacing fixtures and these rods, polyurethane cement was used set everything in place. The cabin was built up with frames and stringers much like a model airplane fuselage. 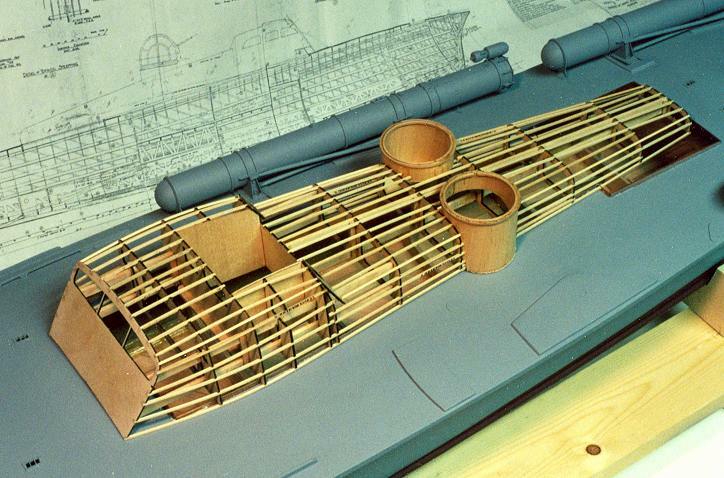 Balsa sheeting covers most surfaces, which was later filled and smoothed with primer-surfacer paint. 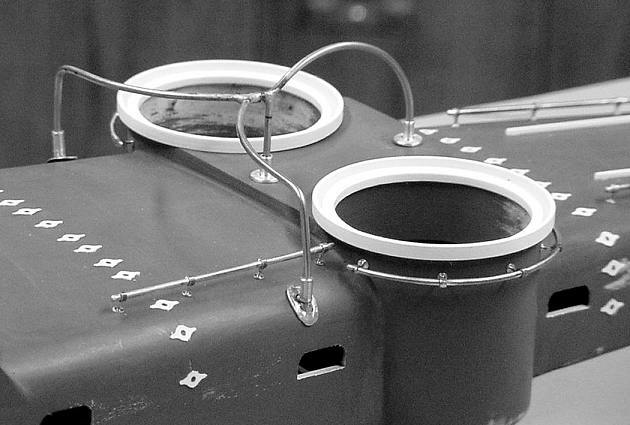 Details such as the metal joiner plates on the cabin, the window frames, and the grate on the cockpit floor were sourced from the laser cutter. 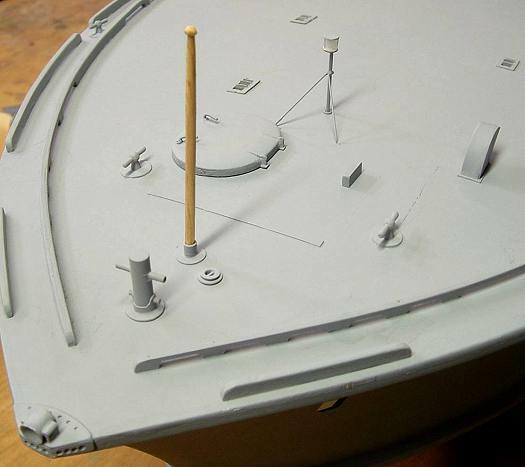 Many other parts started with hand-made masters from which resin castings were made, such as the deck funnel vents, deadlights, and chocks, or were simply turned on the lathe, such as the brass stanchions for the grab rails. The laser-cut cabin frames are visible under the stringers. Brass rod and lathe-turned stanchions make up the depression and grab rails. 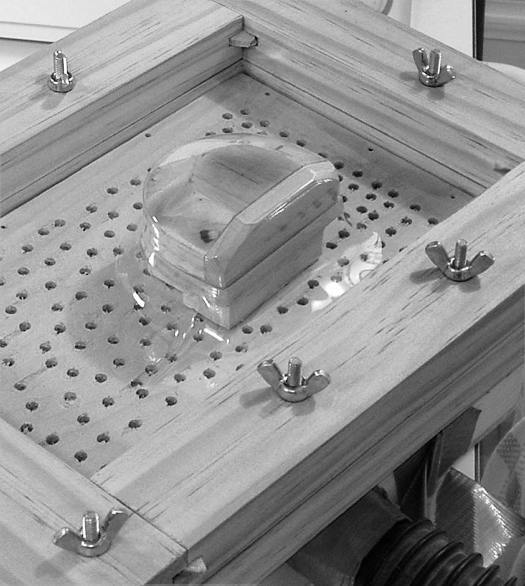 A homemade vacuum forming rig was needed to form the turret sides. 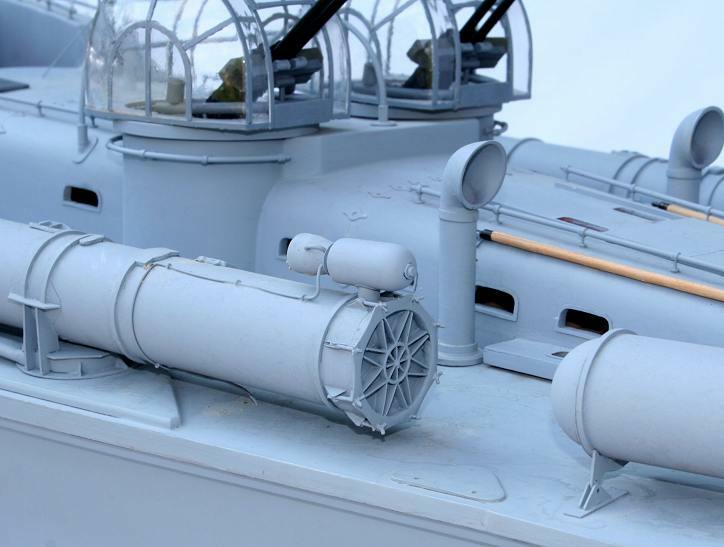 The torpedo tubes started as ¾” PVC pipe, and were reamed out for weight reduction. Styrene strip, lathe turnings, and resin castings completed the tubes. The turrets made for one of the most aggravating jobs, which I fussed with on and off for months. I built a small vacuum forming rig, but was unable to pull the entire turret in one shot. I settled for simply forming the sides, and building up the center sections from clear flat stock. The clear plastics which are suitable for forming seem to be exceedingly difficult to glue; I used CA, and had a hard time not making a mess of things with this unforgiving medium. The machine guns, mounts, and ammunition boxes are built up from bits of plastic, wood, and brass. With the hull and cabin painted, the shadowed hull numbers were applied using an air brush and stencils cut from frisket. A final touch was my one purchased detail item on the entire model (other than the props)–the printed flag from BECC. 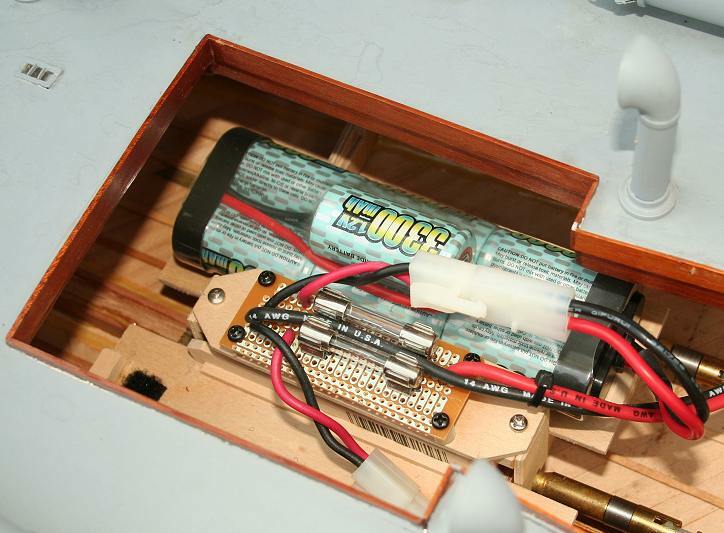 A black powder charge in the chamber on the tube was electrically detonated to expel the torpedo. The ribbed breech door is a resin casting. The large 1:20 scale is helpful when it’s time to make all the detail fittings around the cockpit. More details at the bow. The plates mounting the bow fairlead and stern chocks have punched lightening holes. Not strictly part of the model, the display cradle is another nice detail to have. Elco provided a cradle for each PT that shipped out as deck cargo. The design used steel I-beams in an A-frame plan, with a number of steel beam supports capped with timbers shaped to the hull bottom. 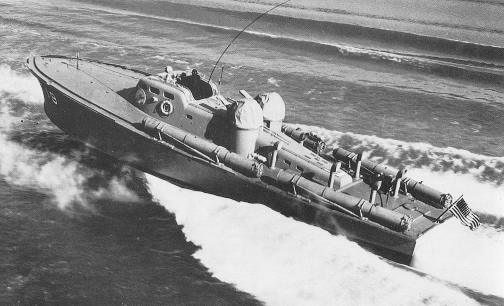 These cradles can be seen in several photos of PT boats including none other than PT-109, which starred in a how-to-ship PT boats instruction manual (Johnson, 103). View of the transom, with six unmuffled exhaust pipes. Bronze props are driven through stainless steel shafts, and the rudders are brass sheet silver-soldered to stainless posts. I’ve found that it’s easy to overpower displacement models with a parts-bin motor and a heavy lead-acid battery. But pushing a four foot, twelve pound model at planing speeds requires a respectable amount of power. The need to control weight in such a model may impact battery capacity, while the power-hungry motors are demanding more capacity to maintain reasonable run times. I took my best guess at appropriate motors and came up with a solution that works for me. The boat can get on plane and “looks” right at speed, but it doesn’t come close to the water-ripping speeds of a fast electric racing boat. Even without water cooling of any sort, the motors don’t get excessively hot, and run times are satisfactory. Elco PTs had a triplet of three-bladed propellers, all rotating the same direction. I’ve followed the same pattern, using three Octura “937/3” 37mm bronze props on 1/8″ stainless steel shafts. These are connected to three Graupner 7.2 volt Speed 600 motors through modified Dumas dogbone couplings. The nylon dogbones were cut and “stretched” with aluminum tubes to make 6-inch long intermediate shafts. The motors are mounted in a single laser-cut frame that ensures correct alignment. Power is from a pair of 3300 mAh, 8.4 volt nickel-metal hydride packs, wired in parallel through 20 amp fuses. Total current draw with three motors under load is about 30 amps. I won’t claim that this is the most efficient power combination to achieve my goal of “good looking” planing, but further experimentation with different motors and voltages gets expensive! One of the two battery packs in place under the engine room hatch. Each pack feeds a common bus through a 20 amp fuse. Three 600-size motors are mounted in a laser-cut plywood structure. The electronics board is fitted forward of the motors. 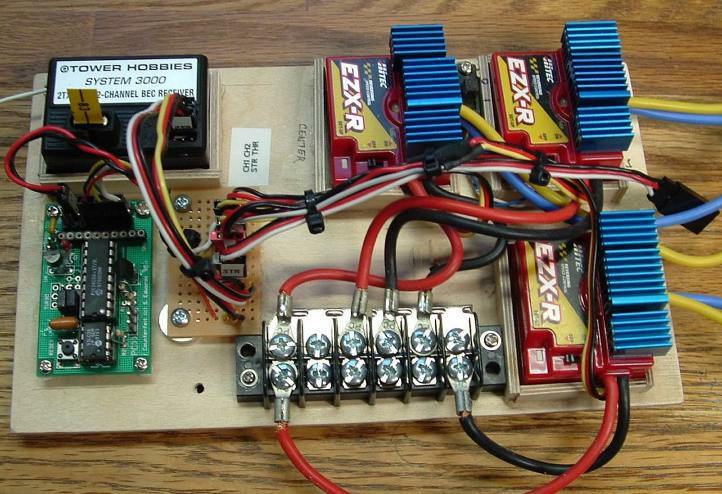 Three ESCs are controlled by a microcomputer, lower left. Forward: The motors pull a fair amount of current even under light load. To conserve power, only the center motor runs at part throttle ahead. At about 50% throttle, the two outboard motors gradually kick in until all three reach 100% at full throttle. The transition is seamless. Reverse: To avoid swamping, only the center motor is active in reverse, and is limited to 50% throttle. Turn-in-place: With no throttle, turning the helm counter-rotates and progressively increases the speed of the outboard motors; port helm spins the bow to the left, starboard helm spins to the right. I’ve found that these modes allow for simple and accurate control of the model in precision steering events with an easy-to-use two channel radio—better than testing my dexterity and sanity with three independent throttles and a helm! Since the props aren’t equally effective in forward and reverse, the model doesn’t quite turn in place, but it comes close. When tight maneuvering is needed, backing off the throttle and “blipping” the helm will bring the bow right around. Maneuvering under full throttle is another story. Even though the triple rudders are already over-scaled by almost two times, they don’t snap the boat around quite as I’d like. Deeper “dagger” rudders might do the job, but are decidedly nonscale in appearance. I’m also fighting a tendency to fall off plane and to plow on the inside in tight turns. I can’t overstate the importance of weight and trim in a model like this. 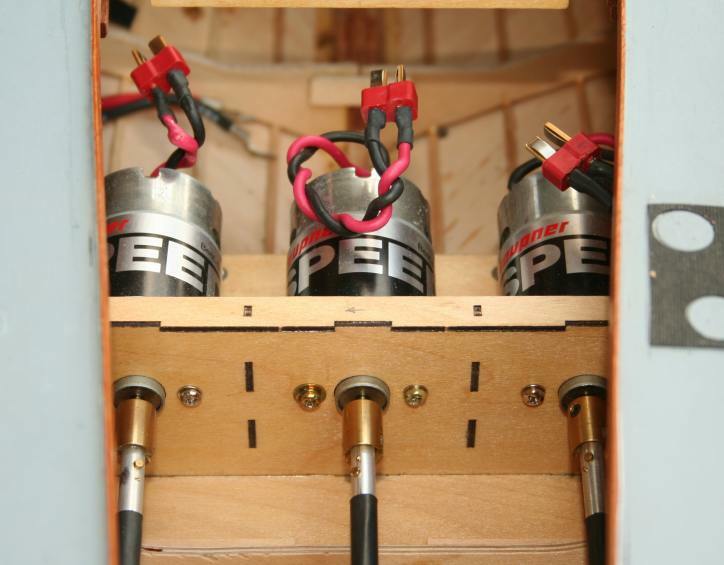 Attention to the weight of all components allows the model to carry three sizable motors and two high-capacity batteries; only a few ounces of ballast were needed to bring the boat to its scale waterline. I found that the placement of these few ounces is enough to make the difference between satisfactory planing and hopeless plowing, so it’s wise to design a planing model in a way that allows batteries and ballast to be shifted as needed. I worked on this project off and on for several years, with many other jobs inserted along the way. Several reworks of major parts were needed—in addition to sealing the leaky hull, the cabin was built three times before I was happy with the results. I’ve crossed paths with other PT boat modelers and even chatted with PT veterans, and accumulated a hoard of PT information. There are still a few details to add or correct, but I’ll leave those unspecified for now! The model achieves a satisfying plane while leaving a respectable wake behind. Elco Naval Division. Engineering Drawings. 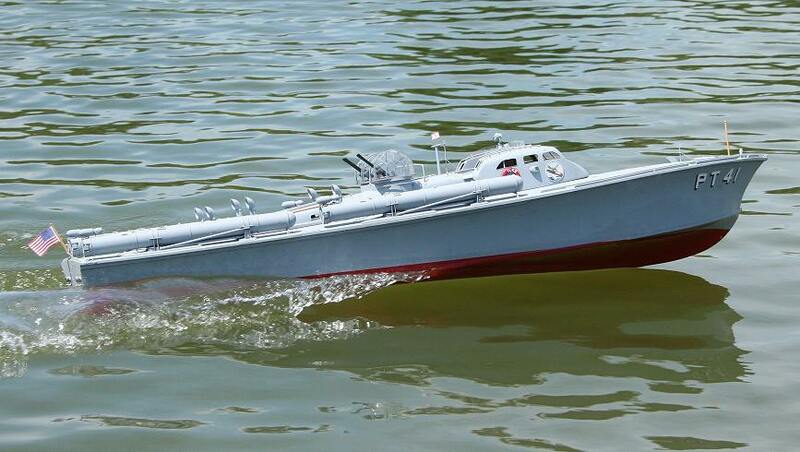 “Elco 77 foot Motor Torpedo Boat PT-20 Class”. National Archives and Records Administration. Record Group 19, Microfilm Roll #310. Ferrell, Bob; Ross, Al. Early Elco PT Boats. PT Boat Museum & Library. Memphis. 1980. Johnson, Frank D. United States PT-Boats of World War II. Blandford Press. Poole, UK. 1980. Kelvin-White Co. (Spherical Compass). Advertisement. Yachting Jan. 1942. Lambert, John; Ross, Al. Allied Coastal Forces of World War II. Naval Institute Press. Annapolis. 1994. Polmar, Norman; Morison, Samuel. PT Boats at War- WWII to Vietnam. Motor Books International. Osceola. 1999. White, W. L. They Were Expendable. 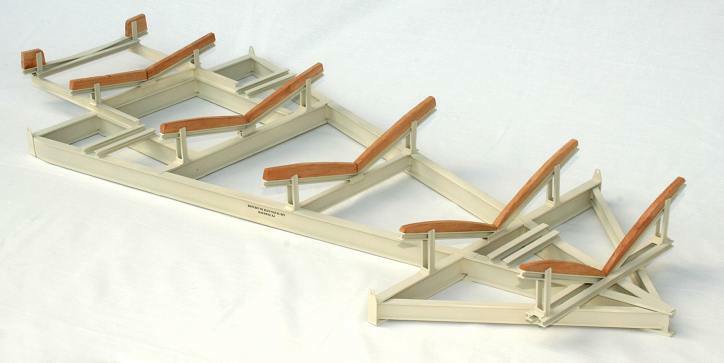 Harcourt Brace. New York. 1942. Chun, Victor. American PT Boats in World War II: A Pictorial History. Schiffer. Lancaster, PA. 1997. Connelly, T. Garth. PT Boats in Action. Squadron/Signal Publications. Carollton, TX. 1994. Elco’s “A-frame” cradle deserves a page of its own, along with info on how to model it. Maybe someday! But here are a few items… one of many available photos, and several sketches showing the dimensions I used for a 1:20 scale model for the Elco 77. Without the aft extension, it would be suitable for an Elco 70. With modifications for hull shape, it is also suitable for Elco 80 footers. I have built the A-frame with Plastruct I-beams… very flimsy for a heavy model, be careful! I also constructed one in 1:24 from I-beams built up from basswood strips… much stiffer. Thanks for the comments, Tom, and I hope you find some water in the desert! I’m afraid I only laser cut the cabin forms, and those drawings are long gone. But the hull formers aren’t hard if you work from good plans. Nice article and excelent build. FYI- I have an original wartime publication of “They Were Expendable”. I had a poster when I was a kid of a PT boat charging at the viewer with a knight in armor in the background sky, titled ‘Knights of the Sea.” I suspect it was in your ad collection. Any way of seeing if it is? This, and several other paintings, were featured both as magazine ad art, and offered as posters. They come up on ebay frequently. I have the Knights of the Sea ad, but not the poster. And I used to have all the ads on a web site, which is no longer up, sorry! But search Google on “Knights of the Sea”, you’ll find that image. Nice work! I am in the process of building a 1:20th Elco. Wow, THE Frank Johnson? Thanks! nice. I was actually looking for the ElCo Ad with the horse/lance and the boat. It was a fixture at the Singer (Elizabeth NJ) Yacht Club clubhouse for decades directly accross from actual Elco factory In Bayonne. I’d love that print or painting. Just check ebay, it comes up frequently. Search on things like “PT boat”. It has been available as a color magazine ad (small), and a large print which Elco would mail to you for 10 cents. The prints come up less often, but they are there too. Great Boat Pat!!! Been a great fan of your work over at RCgroups for a while now. Been wanting to a do an approx. 4′, 77 footer for a while now, PT 66 or 59? Best wishes and Happy holidays. I have over a thousand dollars worth of model ship tools and related paraphernalia that have remained untouched for over a year.or two. No big life changes or stressors can explain it. Anyway, your PT has returned the enthusiasm I have have had for fifteen years. Bravo Zulu, great job. Great build on the 41 boat, Pat. “Just thought you’d like to know” a favorite saying of my late brother John D Bulkeley who commandered the PT-41 in the Pacific . Nice model. I wondered what was your inspiration? Well, what an honor and privilege! I only hope I can do right by the Admiral. Like many RC boaters, I started out by modeling a PT-109 (Elco 80 footer)… PT models are almost as exhilarating to run as the real thing! But for various reasons I lost interest in that build. Still bitten by the bug, I fell in love with the early Elco 77 footers… and any research at all will show that the most famous of these was PT-41, on which your brother had so many adventures. how can I get detailed plans for building a PT boat? Yes you can. http://www.parallax.com, “Basic Stamps”. Also look into Arduino and Raspberry Pi. Sorry, learning to program, you’re on your own!